The Aerospace & Defense industry performs an exceedingly delicate balancing act between production and demand. Excess capacity lowers margins while insufficient capacity can cost millions in lost revenue. As a result, manufacturers focus on dynamically matching their production rates with market pressures – simultaneously striving to improve first time quality, lower costs and ensure on-time delivery. Companies have a high incentive to solve these challenges. The reported eight-year backlog in meeting commercial aviation orders may well double in the next 20 years. Add to that the significant ramp-up of defense spending, not to mention the commercialization of space, and you’ve got a big industry with a big problem. How should Aerospace and Defense companies capitalize on this unprecedented wave of demand? Listen to a number of experts on how Aerospace companies are meeting the challenges of meeting the backlog of demand and the new technologies that can help. Learn about the key to success and the challenges you will face as you work to implement the Future Factory today. Leading companies recognize the power of technology to fundamentally change the way they do business and meet today’s challenges. In particular, digital continuity is set to solve a multitude of production and product development challenges facing the industry. Thanks to Industry 4.0, or the 4th Revolution, new technologies can combine the physical, digital and biological worlds. This changes the way A&D companies conceive, design and build products. It is possible to share 3D models across your enterprise and supply chain and communicate in real-time with no language barriers. Embracing this awesome new technological power can positively change a company’s future. Read more about the future factory. Velocci describes a brave new world of self-regulating machines: customizing the product builds, allocating resources in the most efficient manner, and interfacing seamlessly between the physical and virtual worlds of production and assembly. Wireless sensors in manufacturing equipment, processes and products provide real-time shop floor information – fueling predictive analysis for those few remaining humans required to oversee the product lifecycle. This new digital infrastructure encompasses old analog tasks and machine operations, while shifting the manufacturing process from isolated silos to integrated systems that work right across domains, hierarchical boundaries and lifecycle phases. It follows that, if you stick rigidly to your existing vertical ecosystem, the new tools at your disposal won’t work. The real world might be round, but the working world is becoming very flat. Breaking down information silos fosters cross-functional cooperation, so everybody involved in a project can immediately access and use information as it becomes available. This reduces wasted resources from not having the right data at the right time – therefore leading to productivity gains. The manufacturing landscape faces dramatic change. Creating and capturing value requires aerospace companies to understand what’s driving these changes and the role digital transformation plays in determining the future. To get onboard with the concept, companies must explore what is really meant by ‘digital continuity’ and its importance to the future of both their enterprise and the industry. Read more about digital continuity. “In the 21st century economy, we cannot afford to not know that the version of design we are using has been obsoleted by a newer design,” argues Grieves. “We cannot afford to have engineering send designs to manufacturing that manufacturing knows cannot be built properly or cost-effectively. We cannot afford to not know what machine-to-machine communications are occurring that will result in a major manufacturing failure.” This ‘knowing’ information across the product lifecycle has become critical as information has gone from being on physical pieces of atom-based paper to digital bits. Knowing that information can be relied on to make decisions. So, how do you transform the theory of ‘certain, singular real-time knowledge’ into the working reality of your future factory? That requires a production system to provide a foundation to collaboratively model, simulate, operate and optimize your manufacturing. In addition, your company needs to ensure that its systems possess the automated means to secure sensitive product data and processes that underpin your market offering, as well as protect customer data. Those systems will also need to manage the flow of regulated data that meets, for example, the United States International Traffic in Arms Regulations (ITAR) and other export regulations. Some companies have taken the lead and fully embraced the digital revolution with great success. For example, Messier-Bugatti-Dowty, the world’s leading manufacturer of aircraft landing and braking systems, is increasing manufacturing agility throughout production using a software solution from Dassault Systèmes on the 3DEXPERIENCE® platform. The 3DEXPERIENCE platform provides the digital continuity needed to meet production rate and quality goals. It connects planning to the shop floor through a ‘digital twin’, so management learns about – and can immediately react to – potential issues in real-time. This power to foresee the future and correct errors before they become real problems results in higher production rates. The 3DEXPERIENCE platform provides us with a unique platform with data references for design, delivery and maintenance. This digital continuity ties all our sites together so that everyone is working with the same and most up-to-date product information with real-time accessibility. 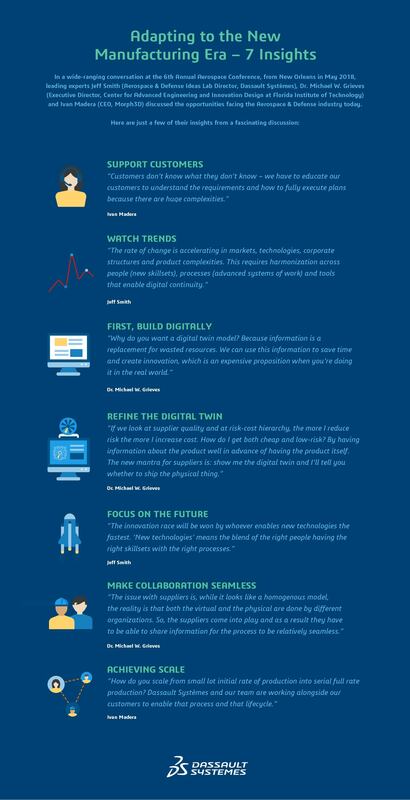 Digital transformation gives organizations the ‘superpowers’ to take on the villains of wasted time and inefficiency that rob you of productivity and innovation. Optimize end-to-end manufacturing processes and supply chains before production ever starts. Test products virtually to deliver Six Sigma quality in the physical world. Design and develop aircraft digitally – fixing mistakes on a digital twin so it’s built right first time. Validate optimal configuration to meet requirements – on time and on budget. Share information with global teams in real-time to leverage best practice. Collaborate and work as one team – erasing barriers of distance, language and culture. Plan ahead for innovation and control global manufacturing to increase production / delivery rates. Every one of those technological powers transforms your company into a faster, better and stronger business. More agile in every way. Better still, these powers can be yours by embracing industry 4.0 and founding your own ‘Future Factory’. You can improve decision-making – staying on budget and on time through 360 degree planning, simulation and instant insights. You can enhance manufacturing quality and planning – meeting budget targets and contract deadlines. You can integrate your suppliers with full traceability and track quality issues in real-time. And then you can continue to strengthen your manufacturing prowess with unified change management, simplified certification and much more. Indeed, as every proper superhero would say, you can’t stop doing good once you start. The power of success is addictive. Nothing beats the real-world experience of our customers – especially when their achievements today were considered impossible just a few years ago. These three business cases show you the rewards for Aerospace and Defense companies using the 3DEXPERIENCE® platform. Digitalization is a key element of our future strategy. Learn more about how our Industry Solutions can help you achieve agility of rate.